SOG PE14 PE14 Pentagon Elite I Serrated Folding Knife FREE SHIPPING! The Pentagon Elite 1 Serrated Folding Knife from SOG is a powerful and versatile knife that is a favorite among America's military heroes. Its perfectly-weighted design offers smooth handling that is unparalleled by other knives in its class. The blade is crafted from VG-10 steel for superior edge strength and features a shark-tooth point that reinforces the tip to create a virtually indestructible blade. 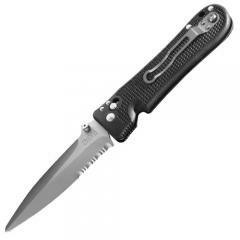 Dual thumbstuds allow the user to effortlessly deploy the Pentagon Elite's blade from either hand in one quick action. The handle is constructed from glass-reinforced nylon (GRN) and strategically textured to enhance gripping power in wet and icy conditions. Once opened, SOG's unique arc-lock system secures the blade into place, guaranteeing safe and dependable use. ©2002-2019 CopsPlus.com: SOG PE14 PE14 Pentagon Elite I Serrated Folding Knife FREE SHIPPING!